The “prasadam” were fresh grapes, cookies and tiny condiments in wrappers. The devotees were mostly young Chinese. And, it was a rare interactive session held by senior members of the International Society for Krishna Consciousness (ISKCON) in Beijing on the Bhagvad Gita combined with insights into yoga on Saturday afternoon. On sale outside the auditorium was a new version of the Gita in Chinese. 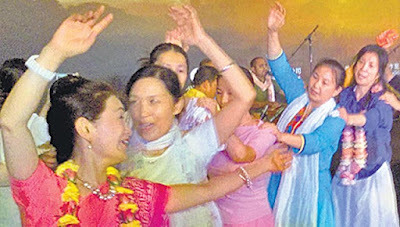 Copies of the "Bu Jian Fan Ge" in Chinese or “Bhagvad Song” sold rapidly from the counter as visitors picked up their copies for the price of an entry ticket at 200 yuan (Rs 2000). In the auditorium, musicians from India played the mridangam, flute and harmonium as trained singers sang “bhajans” and the well-known tune of “Hare Rama, Hare Krishna” associated with devotees of Krishna. It was at the end of the programme when literally the entire room full of people removed their chairs, made space at the centre and danced to the chant for nearly 45 minutes. “The talk (on the Gita) was not about religion. It was more about connecting people. Use Yoga and the teachings of the Gita to connect people,” Chang Ann, a Chinese yoga teacher and one of the organiser of Saturday’s event, told HT. “We cannot talk openly about religion here,” Chang added. On stage, 68-year-old Swami Kavicandra from the US talked about what the Gita said about happiness and how transient it was. At the end of his simultaneously-translated talk, the stage was thrown open for a few questions, with the queries to the Swamis on life, loneliness and marriage. “More than 8000 copies of the new Gita have been sold in China till now. Earlier, scholars translated it. But it was just a translation. They did not have “Bhakti”. We need to transfer knowledge from one language to the other,” Gaudiya, a follower of the Bhakti movement saint, Chaitanya Mahaprabhu, from south China said. On a muggy Saturday afternoon in Beijing among a few hundred Chinese, that “bhakti” was quite apparent.